We have only made subtle improvements to the original design over the past 30 years and the C325BEE is no exception. Here, we use the same solid platform as the C320, while adding an MP3-type socket to allow for related device connectivity. This feature along with our Patented PowerDrive and Soft Clipping technologies, combined with our rock solid amplifier section make for a performance which will rival any contender in its class. The end result is a machine that generates magic derived from MP3 compressed files. This amp is an Untouchable value for the money; I've heard nothing under $1000 that sounds better than the 325/326BEE, and a lot of things above $1000 that sound worse. Stunning, absolutely unreal sound quality. Effortless bass response, utterly transparent mids and highs; zero granularity or nonlinearities at any output level. Undetectable levels of distortion at all frequencies and any volume, right up to clipping. Preamplifier is very good indeed, if you need more power and bypass the amps. Bought this second hand, after disappointment with new NAD D 3020 which to me sounded thin and lifeless. I am playing from laptop through HRT Music Streamer II DAC. First hooked it up to JPW Gold Monitors, which are bright speakers and it sounded awful, harsh and far too much treble. Then replaced with Wharfedale Diamond 9.0 (I have a Wharfedale SW-150 subwoofer ready to take on the bass), and the difference was dramatic. The sound was wonderfully warm and clear, full of air and soul. Bass was fast and clear (haven't even hooked up the sub yet). Played reggae, house, acoustic, folk, it all sounds lovely. Lesson: partnering equipment can make a big difference! Nad 325 is a quite a special amp. Its characteristics derives from high end tube amps which I particular fancy. The Bass is the tightest I have herd in this price range leading up to $1500. Mid is very clean and open and treble has brilliant clarity and good dynamics; immensely detailed without being strident. Presentation is huge and very spacious. This amplifier is rated at 50w per channel but nonetheless many amps quoted at 100w ran out of gas when driving complex load but this wasn't the case with Nad. You would have to pay 5 times as much to better this. A must buy!! This amp simply does 90-95% of what the much more expensive intergrateds do at fraction the price. If you are more interested in just listening to the music than being critical of every nuance of the equipment, this amp will satisfy in spades. Balanced, quiet, well composed sound is what you will get. My listening room is about 170 sq ft and there plenty of power left that I don't use or need. Equipment used: NAD 515BEE CD Player, Tannoy Sensys 2 Speakers, Audio quest interconnects and jumpers on back of amp. In the past 8 years, I've been on the upgrade merry go round. I've owned integrated amps mostly, but some amp/preamp set ups. everything I've owned prior to the 325 has been over $1500 up to $3500 retail. You think you always get what you pay for? If I had started with this Nad, I wouldn't be a high volume buy/sell customer at Audiogon. The amp I most recently owned was an Arcam a85 at 85watts. Let me start by saying the nad is much more powerful. The bass is much stronger and defined. The mids and highs are just more open, airy and musical. If I see any negative reviews for this product, I know, from my experiences, its probably a cd player or turntable that is insufficient. 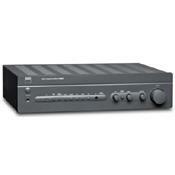 A very good cd player is essential to a quality system more than any other component. If you see this review and your thinking about spending a lot more on an integrated., do as I did and buy one used on Audiogon for about $200. If you don't like it, sell it for about the same $$. Also, one very necessary upgrade for this amp, the posts on back are a weak link. call frank at signal cable and he makes a solid silver set of jumpers for $50. that is an excellent change that opens this amp up significatly. This amp reminds me of a 100 WPC tube amp. It's just so smooth, musical and detailed. It has that tube magic that I have never heard in a solid state amp. I have now had this amp for 4 days and every day it gets better as it breaks in. I am very pleased with my purchase. I use to have the Audio Research and Thiel but not that I have children, this will have to do. Don't get me wrong, this is as or more enjoyable that that stuff. I am using it with a pair of small Castle Acoustic floor standers. Great little amp. Built myself a couple Gainclones and this is much better. It's just plan musical! The bass has a warm and fast sound. It reminds me of the best bass I heard from expensive tube amps. The NAD 325BEE may present detail wonderfully also because I use the Arcam FMJ 23T CD player which I love though I am not really a fan of their amps. Also, I took out the plug from the pre out and main in and use Tara Lab 2200i interconnects instead which characteristically favors the bass. Next, I use Audioquest Type 4 which sounded better than Kimber 8TC with these speakers and also made the amp sound more powerful than when I tried Straight Wire speaker cable. Lastly, the PSB Alpha B1 bookshelf speakers were bought at the same time with the amp and they are synergistically a perfect match! It is hard to tell what is the amp and what is the speaker since there is not a consistent emphasis from one part of the sound spectrum. Sometimes it is the highs, other times, the mids, or sometimes the lows. It just depends on the song and how it is recorded. This is not the experience I have had with other amps that have that same sound everytime no matter what you play (or what you pay!) If you have not bought your speakers yet, I would try this amp with the PSB Alpha B1s. If you aleady have speakers that are not easy to drive, in that case, i would look for another amp. Though I have heard the Vandersteen 1C with the NAD 325BEE, I like them better with the NAD 352 and the 2CEs with the NAD 372. For now, the NAD 325BEE seems to be a perfect amp for your favorite bookshelf speakers if they are easy to drive!! Also, it is great sounding (I think) because of synergy and the room size of 12x13 which does not need a lot of watts to fill. The lively sounding little miracle, The bass is almost alive!!! It is even better, than C355BEE, is it a weakness??? NAD C325BEE is one of the best sounding integrated amplifiers in the price range up to 1000$. It continues the good style of C320BEE, which i have been using too. When listen to the sound of C325BEE you want to sing, just because the perfofmance is so good, fresh and dynamic. The bass is amazing, deep, fast and strong. Mids are detailed and transparent, highs are good too (considering the price). I wish NAD always to produce such miracles. I like this thing and give it 5 stars with confidence. It is even better, than C355BEE (which i have, but dislike - 3 stars, no more...), and louder too in fact! C325BEE - is the great integrated amplifier. If you are going to use it in 20-30 sq. meter room with sensitive fine speakers - there is no other in this price range. Its reliability and sound quality will give the real satisfaction! I auditioned the C325bee versus the NAD352, and CA 340. Couldn't tell much of a difference between the 325bee and the 352 (maybe a bit more depth with the 352, but it is pricier). The 325bee sounded less muddy than the 340, with more bass depth to it. I might add that it is 50 wpc, but I rarely ever have to turn it up past 10 O'clock to get to very loud (tolerable) levels, so I'm not sure how manufacturers rate the power of amps these days, but this will do fine volume wise in a medium size room (25 x 20 living room). Couple of other things I noticed were that at higher volumes, the music holds together very well, with the Onkyo when at higher volumes it would start to get harsh sounding. Same with low volumes, the music and the details don't get lost with the NAD even if its at background levels. Noise floor is excellent. While looks is a matter of taste, I do like the minimalist look of the unit, and while the face of it is kind of a hard plastic (a little cheap looking), I notice that the kids fingerprints don't seem to stick to it, so it always looks fairly "clean" or not smudged. Good remote, well laid out and sturdy. Lots of inputs, including front one for MP3 players. Tone controls perfect (not overdone). I am sure there are better amps out there, but I and my budget haven't bothered to explore the next level, and don't feel the need to right now. For example, I wouldn't suggest this amp gets you perfect 3d imaging, but nonetheless this seems a great amp for the price. I listen 90% to music off of cds (not downloaded & burned, as I notice the sound quality dips) and can say paired with a half decent cd player, it really takes you a far notch in terms of sound quality above the "bestbuy HT receiver system and dvd-player-as-cd-player combo". No phono stage input, for those that like that included. For the remote, the volume increments could have been made more precise. Sometimes you can't get exactly how you want it with the remote. I'd say so-so headphone output, so I tend to listen to headpones through the output of the cd player instead. 1. Overall greater presence and "liveliness" of the music (indie and brit rock mostly, some folk). On some well-produced recordings (ie, Police, Radiohead, Tori Amos), you very much feel as if it is live in the studio, whereas this did not occur with the Onkyo. 2. Bass presence heightened and more forceful, it just leaps out at you. With the Onkyo, to get a good bass sound, I had to turn the sub volume to 4-5 on the dial, with the NAD, I have to keep it at 2-3, otherwise the bass is overwhelming. I also noticed that my bookshelf speakers (admittedly budget Athena ASB1s, but pretty good sounding...see the reviews in this site) got a lot boomier with the NAD, as they are placed on a bookshelf and are rear ported. I've had to put a cloth in the ports to control them! 3. Drums much more lifelike, much more slam, more heightened than before. Cymbals more present and lifelike. Rolls and fills that are typically mixed more behind the main instruments get good air, and add to the vitality and propulsion of the music. 4. A Lot better detail extraction from the music and separation of instruments/voicals, especially during complex and busy musical passages. 5. Better soundstage. You can locate instruments, electronic found sounds, and multi-tracked vocals easily.